Tahini is an excellent source of fat, and makes a tasty dressing for salads and sandwiches. 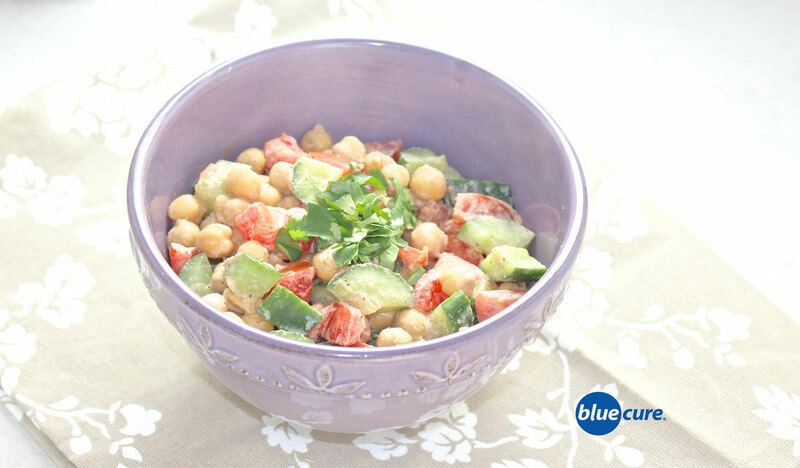 This mediterranean salad combines lemon juice, tahini, cucumbers, tomatoes, and chickpeas. The quick prep method should take you little to no time at all. Rather than making the no time excuse for take out or fast food again, give this mediterranean sandwich or salad a chance! Wash and prep the cucumber and tomato. In a small bowl, mix the lemon juice and tahini. Add black pepper and a dash of salt, if desired. Drain and rinse the chickpeas, if using canned. 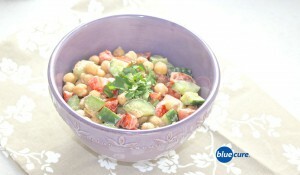 Mix tomato, cucumber, and chickpeas with the dressing. Serve over whole grain couscous, in a whole grain pita pocket, or on a bed of green leafy vegetables. Slow prep method: Prepare dry chickpeas and use in place of the pre-cooked beans.